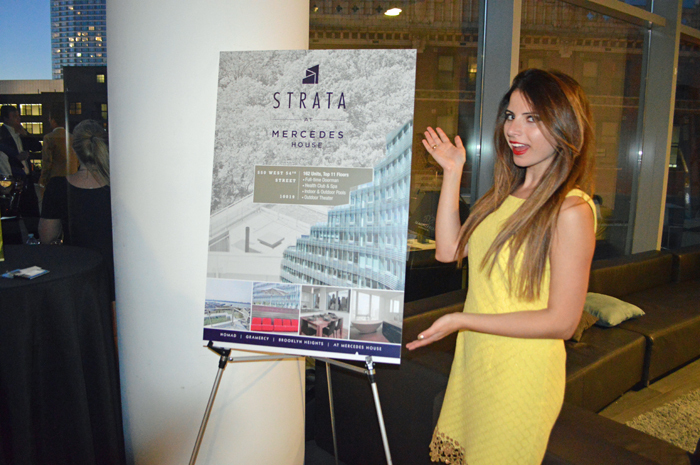 SCENE Magazine, a luxury society and fashion publication hosted a debut celebration party for the extravagant INSTRATA Lifestyle Residences at Mercedes House located on 550 West 54th Street in New York City. Strata at Mercedes House was conceived and designed by world renowned architect Enrique Norten. The building’s wedding cake design allows many homes to have their own private outdoor space for the perfect view of the city and Hudson River. INSTRATA includes 900 rental apartments across 4 prestigious locations at Brooklyn Heights, Gramercy, Nomad and of course Mercedes House. INSTRATA strives to raise the expectations of what defines the modern luxury rental apartment in New York. Fashionable guests, including SCENE magazine’s Editor-in-Chief Peter Davis mingled and enjoyed the incredible views of the city. It was a perfect Summer day. The sun illuminated the outdoor space and there was just the right amount of wind to give you supermodel hair when the Patrick McMullan photographer snapped your photo. Guests were treated to hors d' oeuvres and stylish cocktails by Magnifico Giornata. Italian for “Magnificent Day,” Magnifico Giornata is infused with subtle essences of Lavender Honey, Ginger Pêche or Grapefruit Blanc. My personal favorite was the Lavender Honey. I wore my favorite bright yellow Lilly Pulitzer shift dress. You can't really tell from the photo but the bottom of the dress has a lasered like design which is decorated with shiny yellow sequins. My friend Alex introduced me to his fabulous friend Joshua Pino, the founder of Humanity Indigena. Humanity Indigena works towards the preservation of the cultural heritage of Peru and promotion of global awareness through high quality artisan works. Joshua has quite an interesting and inspiring story. He is the son of a Peruvian orphan who became a missionary, helping the millions of South American people in need, specifically Peru. With Joshua's roots inherently tied to third world countries, it is his personal desire to contribute to the cultural heritage of Peru. The Humanity™ Bracelet is at the forefront of his philanthropic efforts and 100% of its sales go to help stimulate Peruvian micro economies. Check out humanityindigena.com to learn more. Thanks so much to my lovely friend Alex for letting me know about this fabulous event. I mention this in every post with us together but you're truly such a fashion plate! I look forward to many more soirees with you, darling. Can't wait to see what you wear next! SCENE Magazine's party for INSTRATA was definitely one of the crème de la crèmes of events this Summer. Check out more of my party snaps below!